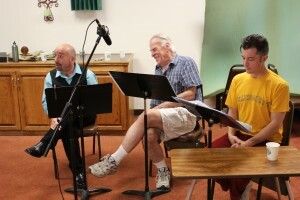 Last week we recorded scenes with Dr. Bull, played by Stephen Alan Carver. Now it is Gabriel and Professor de Worms who must confront him. Something Martin Gardner pointed out in his introduction to his edition of the book, The Annotated Thursday, was that each of the anarchists on the Council of Days, the seven supposed worst men in the world, represented an aspect of life that the everyman Christian (Gabriel) fears. 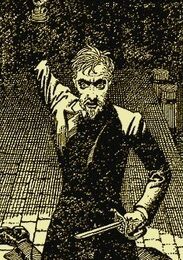 First the fear of the Professor had been the fear of the tyrannical accidents of nightmare, then the fear of the Doctor had been the fear of the airless vacuum of science. The first was that any miracle might happen, the second that no miracle can ever happen. But now I was in the presence of the great fact of the fear of death. We reached the bottom of a huge block of buildings and began in silence up the naked, numberless stone steps. My head spun as they seemed to go on forever– like the empty infinity of arithmetic: something unthinkable, yet necessary to thought; like the meaningless statements of astronomy about the distance of the fixed stars. I was ascending the house of reason, a thing more hideous than unreason itself. The visual of the steps is incredible, and I was excited when I re-read this description in the book as I was building this scene. Chesterton makes it very clear in his book Orthodoxy that he believes that reason is the root of insanity, not irrationality. He believes that man needs a healthy does of “unreason” along with his reason in order to survive this world. It’s the people who can’t comprehend or become comfortable with the contradictions in life that will eventually drive themselves mad. The whole concept of God is wrapped up in philosophical catch-22’s. Those who rely solely on cold reason and logic may never fully be able to grasp the concept. Another motive of Chesterton’s in the book is that before we are reintroduced to each anarchist on the council, he makes sure that we’re reminded of the dangers of this person. I adapted the description of Dr. Bull a little further, especially relevant today because of many people of faith who see scientists as the enemy, and consider science to be the antithesis of everything that faith and religion represents. Professor: I don’t know if you’ve read much about this “scientific revolution.” It’s a reprehensible, Godless vocation. This facility is world-renowned for carrying out some of the most unchristian acts of science and medicine known to man… each a repulsive affront on God’s creation. No doubt that Dr. Bull is the driving force behind this evil place. I was originally tempted to “name names” of our most feared scientific subjects: test tube babies, cloning, abortion, stem cell research. Alas, I decided it would be too political to mention specifics, because my audience might imagine that I’m trying to take a position on these, which I am not. The point is that science seems often like the enemy of faith, and the work of God, but when we look behind those “black spectacles,” we find an entirely different truth. 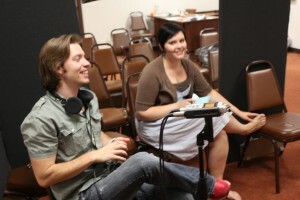 Ben Stanton and Ananda Dillon recording the Dr. Bull scenes.